The Pine River watershed is located in the northwestern portion of Michigan's lower peninsula. It has a drainage area of 265 square miles, and ultimately discharges to Tippy Dam Impoundment in Manistee County. The watershed includes parts of four counties: Wexford, Osceola, Lake and Manistee. 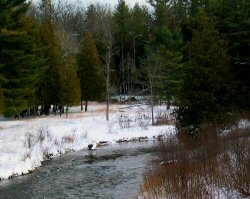 The mainstream is approximately 49 miles long and is formed by the confluence of the North Branch and East branch of the Pine River near Tustin in Osceola County at an elevation of 1,102 feet (336m). Surrounded by the gently rolling moraines of the glaciers that periodically covered the area, the lower 25 miles of the Pine River winds swiftly through a deeply cut channel with heavily forested uplands. The Pine National Scenic River traverses a variety of water conditions, having many sharp bends, short choppy riffles, and passable log and debris jams. The Pine also has a section with class II white water rapids. Canoeist should be aware of high water markers located in the water at each canoe landing. Water leverl at the red mark indicates dangerous high water. The river offers high-quality fishing, small-craft boating, and outstanding scenery. Designated Reach: March 3, 1992. The segment from Lincoln Bridge to the east 1/16th line of Section 16, T21N, R13W. Classification/Mileage: Scenic -- 26.0 miles; Total -- 26.0 miles.